You are here: Home 2013 October for my friend, John B! Dr. Weeks’ Comment: Raw is real! Love your Vitamix! 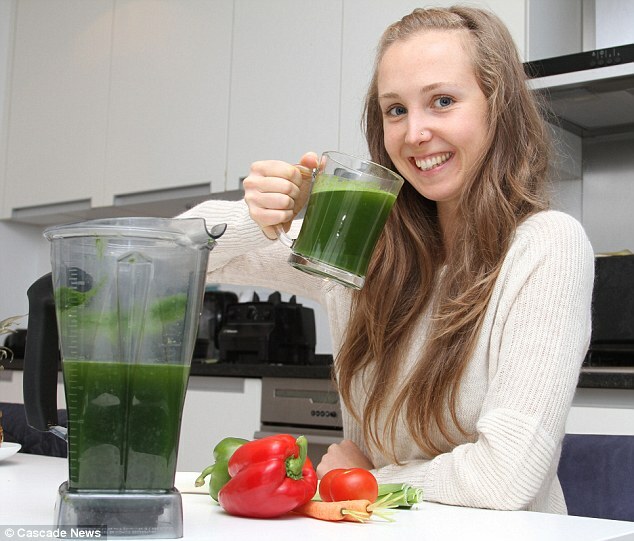 By RUTH STYLESExisting on a spartan diet of nuts, seeds, fruit and vegetables might not sound particularly appetising, but Susan Reynolds, 29, says it keeps her looking so young, she is regularly mistaken for a 16-year-old. 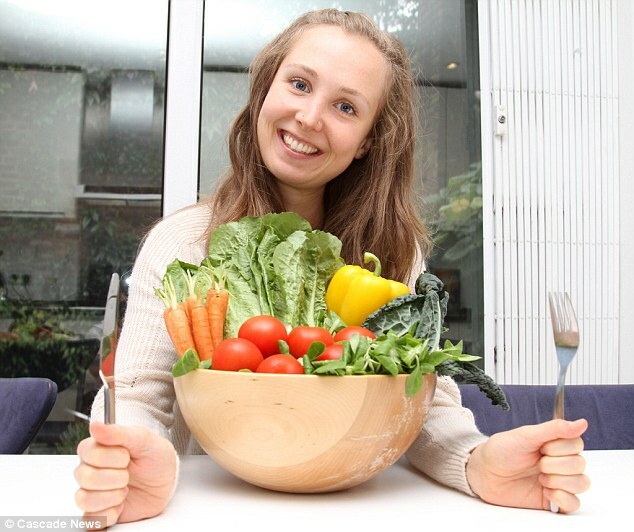 Susan, who hails from Edinburgh, last ate cooked food seven years ago and now consumes nothing but uncooked fruit, vegetables, grains, seeds, nuts, and beans. 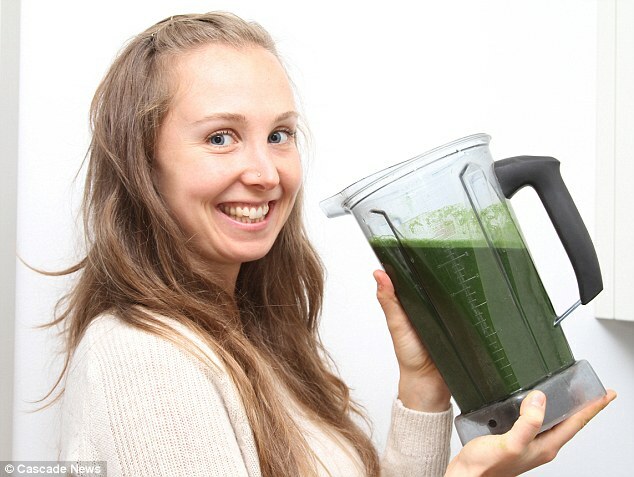 The slim 29-year-old eats dozens of portions of fruit and vegetables every day, and has even created a number of recipes, including a cold soup made from a bag of spinach, a large bunch of herbs and an entire lettuce, to make meals more interesting. Her healthy raw diet is a far cry from her university days, when, she admits, she used to indulge in Chinese buffet suppers. She also loved McDonalds McChicken Sandwiches and used to enjoy crazy nights downing shots of vodka jelly as a teenager. However, all that changed when she became interested in yoga at the age of 21 during a six-month trip to India. After coming home Susan decided to become a vegetarian and trained to be a yoga teacher before stumbling across the raw food diet. ‘I went for something to eat in a cafe called Red Sugar in Edinburgh, which served raw food,’ she explains. ‘The owners told me a bit about it so I went home, read up on it and decided to give it a go. The difference I felt in a day was incredible so I’ve done it ever since. I haven’t had a hot meal in seven years. 6:30am to 8:30am: Yoga practice. spinach and bunch of herbs. 11am to 4pm: Snacks, including whole fruit (figs, mangoes, berries etc. 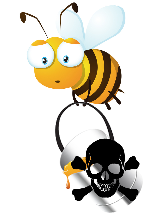 ), raw chocolate, green juice, and superfoods such as bee pollen and berries. 6pm: Large salad and/or green soups, or another raw dish created from fruit and vegetables, soaked nuts and seeds depending on what she feels she needs that day. ‘The benefits include [mental] clarity, positivity, health, energy, radiance and the ability to make choices. And Susan has now turned her passion for raw food into a business named Twist and Sprout, which offers healthy retreats where participants are taught how to introduce the raw food diet to their own lives. Tough though her regime might sound, Susan says she never suffers from cravings for cooked and maintains dietary discipline at all times. ‘I feel if you sort out the emotional attachment to cooked food you don’t crave it any more,’ she explains. 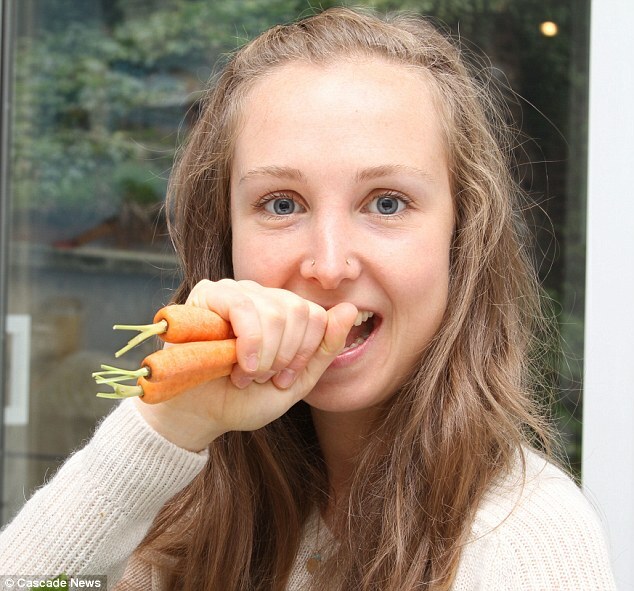 So dedicated is Susan to her raw food lifestyle, she even convinced her parents and boyfriend Louie, 22, to try the diet, and last Christmas prepared a raw food feast for them to enjoy. Nevertheless, Susan admits that her father David, who grew up in Glasgow, is unlikely to give up his pies despite regularly working out. Her mother Marion, meanwhile, is no stranger to unusual diets and according to Susan, cured herself of ME 14 years ago by completely eliminating sugar from her diet. ‘Mum used to be practically bed-ridden but she reversed it with the sugar-free diet,’ remembers Susan.